Its been a while since I was on the forums. Glad to see this part of the forum is active still. Couple years back the speedometer (just that gauge) went dead while driving on the 1991 850i. The car at the time was in its early stages of restoration when my dad still owned it so we never looked into it too much as we though it was just the sensor in the differential. Long story short my dad didn't have time to continue the restoration so the car just sat in the garage. I ended up buying the car from my dad at the beginning of 2017 and i decided to bring this car back. Fast forward to now the car is put together, managed to find and buy all the missing pieces, even engineer some things that i couldn't source etc. I will make a huge thread/maybe a video on the whole car so I don't get to detailed here. The last thing I need help with is that speedometer gauge to fully enjoy the car. It does not budge or work at all. -cluster test was 100% ok, all gauges worked. -replaced the DMEs, as the ones with the car had a Jet performance chips and only one out of the 2 computers were OEM, they were not matching number DMEs, and the one that was not matching used to get hot. After the swap everything was good. While driving the temp gauge works, the tach works and the fuel gauge works as well. Although I think whatever is causing my speedometer not to work is screwing with the fuel gauge a little bit as well. During the restoration I ended up buying both new fuel assembles for both sides. The odometer does not count the miles, the trip odometer does not work as well as long as all the other functions in the on-board- computer that are related speed or distance (Range function works). I noticed though I keep blowing FUSE #1 when the car is started. Fuse #17 (i think thats the other instrument cluster fuse) is intact. Fuse #1 only blows when you start the engine, it is intact still when you turn the key to the position right before you start the engine. I am puzzled, people on the E31 facebook pages mentioned that it could be the General Body Module or the EKM. The GM was rebuilt, so I dont think thats it. The EKM i dont know. Everything else works in the car. The car runs smooth. Im not electrical person at all, iv been slowly teaching myself how to read the ETM and all the electrical diagrams. This whole E31 project has been wild ride as the E31 that my dad picked up to save was destined for the junkyard/being a part car. Long story short i would have probably been better off buying a really nice example of a 850i and buying my dads as a parts car and it would probably be just as much as iv dumped into this car already. Any help is appreciated, from pin and connector numbers to what to check for and how to run a test for things if possible. The A1 general module (GM) is unrelated. It does not even have to be installed for the speedometer to work. I also don't think the blowing of fuse F1 is related to your issue. If I had to make a guess I would say it's most likely caused by the HVAC system or auxiliary water pump. The instrument cluster test is not a very reliable test to determine correct operation but since both instrument cluster and onboard computer (MID) do not receive a speed signal, it's quite safe to rule it out. That leaves only the speed sensor (but you mention it was replaced), the A25 body electronics module (EKM) or the wiring in between. You mention an issue with the fuel gauge but do not specify it any further. It is however noteworthy that the fuel level sensors and speed sensor share the same wiring. Personally I'd focus on the wiring for now. 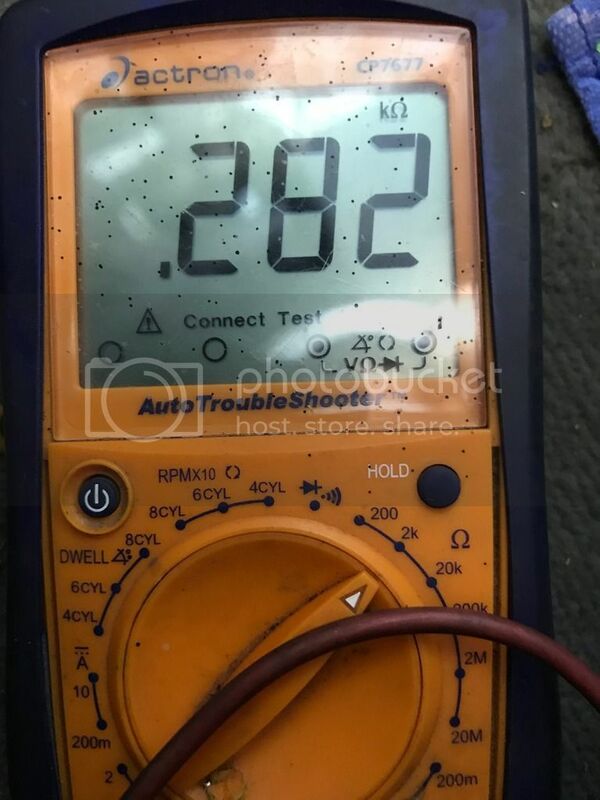 Do you have a digital multimeter? If yes, locate the EKM in the lower regions of the driver-side dashboard and disconnect the large brown 26-pin connector (X40). You can safely do so with the batteries connected. Measure voltage to ground and pins 5, 14 and 26 (of the cable, not the module). You should not read any voltage. Measure continuity to ground and pins 5, 14 and 26. There should be none. Measure the resistance between pins 5 and 26 (fuel tank sensor). It should read somewhere between 10 and 250 ohms (depends on fuel tank content). Measure continuity between pins 5 and 14 (speed sensor). It should either read open circuit or short circuit. You may wish to lift the rear of the car and with the transmission in neutral rotate the wheels in one direction (you'll need two people for that because of the differential). The continuity test should now return an on/off signal. Thank you! I will get to that this week. And yes I have a digital multimeter. I just want to be sure, when you say ground can I put it on any metal piece on the body of the car or should i try to use the ground thats on the firewall behind the carpet on drivers side (LHD)? So if anything is off from what are saying, its safe to say something is up with the wires? I wonder how long it will take me to find the broken wire (if any). I just assembled the entire interior together, im already getting nervous that I will take it apart again. Ever since I got the car the fuel gauge and the temp gauge (if the engine was warm) would spike up before starting to their positions. I heard that those should gradually (slowly) move to their positions when you turn the key. The fuel gauge was misreading the level a little bit, then one day the fuel level would move down to half while driving and then when I stopped it was going up. It was going about half the speed the tachometer was going. It basically magically refiled my tank while idle and magically "dump gas" as I was driving. Later I discovered that the one side of the tank, did not read properly when I checked the resistance (per help from a fellow E31 owner). So i purchased a new driver side (LHD) fuel level unit. I decided to buy the passenger side one as well as that one was showing some wear. I also changed the fuel lines that attach to the pumps. Things were a little better. The other day, I filled up the tank (about 10 gallons, while the gas gauge was displaying below half (about 2/3 way to the half mark) and the needle didnt move until i drove around for a while and it showed about 3/4 of gas in the tank. But after about 20 min it went back to half. While driving the needle does move since gas is being transferred from one side of the tank to the other. But it just freaks out randomly where it does not display the correct fuel level. I believe the common ground for fuel and speed is on the driver side (LHD) under the door card/carpet/rear seat. I think I am not sure. I just want to be sure, when you say ground can I put it on any metal piece on the body of the car or should i try to use the ground thats on the firewall behind the carpet on drivers side (LHD)? Measure against the common ground of the car (thus any piece of body metal). We want to make sure there's no connection to it. If there is, there may be a wiring issue (chafed insulation for example). So if anything is off from what are saying, its safe to say something is up with the wires? Yes, unless something is wrong with one of the sensors of course. What you are measuring with X40 disconnected is just the wiring, the speed sensor and the 2 fuel level sensors. There's nothing else in between. As for the fuel gauge, Ever since I got the car the fuel gauge and the temp gauge (if the engine was warm) would spike up before starting to their positions. I heard that those should gradually (slowly) move to their positions when you turn the key. Yes, that is rather weird. It's not supposed to do that. I'm not sure what may cause this. The temperature gauge wiring is completely independent from that of the fuel level sensors and speed sensor. The fuel gauge was misreading the level a little bit, then one day the fuel level would move down to half while driving and then when I stopped it was going up. It was going about half the speed the tachometer was going. It basically magically refiled my tank while idle and magically "dump gas" as I was driving. Later I discovered that the one side of the tank, did not read properly when I checked the resistance (per help from a fellow E31 owner). So i purchased a new driver side (LHD) fuel level unit. I decided to buy the passenger side one as well as that one was showing some wear. I also changed the fuel lines that attach to the pumps. Things were a little better. The other day, I filled up the tank (about 10 gallons, while the gas gauge was displaying below half (about 2/3 way to the half mark) and the needle didnt move until i drove around for a while and it showed about 3/4 of gas in the tank. But after about 20 min it went back to half. While driving the needle does move since gas is being transferred from one side of the tank to the other. But it just freaks out randomly where it does not display the correct fuel level. The fuel level gauge is not controlled directly from the sensors in the fuel tank but is calculated by the EKM. During driving the fuel level readings may fluctuate heavily due to the shifting fuel. Therefor the EKM uses the last known stable reading (stationary or steady driving) and subtracts the calculated fuel consumption based on the injection signal of the DME modules. Once the tank reading stabilizes again, the EKM slowly balances out the calculated value. This works fairly well unless for some reason the formula used to calculate the fuel consumption is completely out of sync with the real consumption. Like for example if there is a bad fuel level sensor. Measure voltage to ground and pins 5, 14 and 26 (of the cable, not the module). You should not read any voltage. I did this, and I had 0 for all the voltage readings. Unless I didn't attach my ground correctly. I will try this again this weekend just to make sure. Measure continuity to ground and pins 5, 14 and 26. There should be none. I did this as well and I had no continuity at all on those. Measure the resistance between pins 5 and 26 (fuel tank sensor). It should read somewhere between 10 and 250 ohms (depends on fuel tank content). This is a little interesting as I think I might have had overfilled the tank, I had it on k ohms and I had a reading of 0.282 to 0.283. See picture below. The gas gauge is currently only showing 1/2 a tank. Im starting to also think the hose that transfers fuel from one side to the other is maybe bad or clogged and most of the gas is trapped on the driver side of the tank. Measure continuity between pins 5 and 14 (speed sensor). It should either read open circuit or short circuit. You may wish to lift the rear of the car and with the transmission in neutral rotate the wheels in one direction (you'll need two people for that because of the differential). The continuity test should now return an on/off signal. I did this as well, as I rotated the wheels the signal was going on and off. I will attempt at this again this weekend just to make sure. So far everything checked out as you said except the resistance reading between pin 5 and 26. Not sure where to go from here as if I did all the tests correctly, Im not sure what to tackle next. I also have a link to a video that I will send you over private message to show you what my gauges do (how they spike up). I also forgot to mention sometimes before the engine is started the tachometer will move just jump a little bit (to about 250-500 RPM range) for a quick second and fall back down. Once the car is started it works normally. As for the #1 fuse, my dad pointed out that hot air keeps being blasted on the front window. He suspects a bad heater water valve, which I guess could cause the #1 fuse to blow. I did change out the module that sits on the back of the heater core housing as mine was cracked to pieces on the outside and I was worried that moisture and other items got in it. So i got one that supposed to be working from a 850 junkyard car (junk yard matching) Also my dials are barely lit up on my HVAC controller not sure why, I suspect a bad bulb. Kamiler: I think I might have misinterpret my documentation with regards to the fuel level sensor resistance. It's 10 to 250 ohm per sensor - not for both combined. Since both sensors are in series a reading within 20 to 500 ohm, like yours, is normal (and the measured 280 ohm would correspond approximately with half a tank of gas as shown by your instrument cluster). We don't know exactly how much fuel there is in the tank so I'm not sure the actual value is correct but it's quite clear now there's nothing wrong with the wiring or the speed sensor. That leaves only the EKM... Which is unfortunate because it is one of the more difficult modules to replace. Not because of physical access but because the module is paired with the instrument cluster and replacing one of both with a used part does not work: The gauges will remain dead and the trip/odometer display will show only "EEEE". This problem does not arise when the EKM is replaced with a brand new part from BMW but they charge a ridiculous price for it. Replacing both instrument cluster and EKM does of course work but is dubious as you'll take over the mileage, VIN and coding of the donor car. Several years ago I discovered an easy way to replace the instrument cluster with a used one but I never found a similar trick for the EKM. That doesn't mean you cannot replace the EKM with a used part. It's just not easy... You'll need to desolder the EEPROM from the donor EKM and toggle a few bytes to make it virgin again (or replace the entire EEPROM contents with that of the original module), solder it back on the PCB, install the donor EKM in your car, let the EKM learn the VIN and mileage from the instrument cluster (happens automatically), then re-enter the ZCS string into the EKM module using the BMW DIS diagnostic software and finally recode the EKM using the stored ZCS. A donor EKM module. In my experiments I successfully replaced a '90 EKM with a '97 EKM (different part numbers and not exchangeable according to BMW) but I would strongly recommend to stick to the same BMW part numbers (my experiments were done on a bench with only a small number of other components attached - it's possible not everything worked). Soldering skills and equipment to desolder the DIP8 93C56 EEPROM from the EKM PCB. This is complicated by the fact that the PCB has shielded cans on both sides which have to be desoldered too and the liberally applied conformal coating on the PCB. An EEPROM programmer suited for DIP8 serial EEPROMs like the 93C56. Something cheap like a TL866 will do the job just fine. BMW DIS diagnostic software (up to v44, later versions cannot be used due to lack of programming features unless you have a modified installation that combines a later DIS with the programming of v44). Your vehicle's central coding key (ZCS). The ZCS can be found on a label inside the fusebox lid and consists out of 3 strings (GM/SA/VN). If you do not have the label, you'll have to read it with DIS. As for the #1 fuse, my dad pointed out that hot air keeps being blasted on the front window. He suspects a bad heater water valve, which I guess could cause the #1 fuse to blow. Yes, that is a possible cause. Also my dials are barely lit up on my HVAC controller not sure why, I suspect a bad bulb. I'm afraid that's by design. But several people came up with ways to improve it. Search the forums - there's quite a bit of information on the subject. Here's my own fix. Oh man looks like I got a hefty task on my hands. Im going to have to look for at least half of the items you mentioned. I already started looking at picking up a 2nd EKM so far I havent seen anything cheaper than $300... for a used one. Is it possible that something inside can be fixed? Specific to the issue I am having? I will probably take out the EKM this weekend, so ill take a peek inside. Its weird as I think im still showing a bad reading. Something is either up with my fuel lines or something because I thought I overfilled the tank (well almost) because when I took the hoses off the driver side fuel assembly gasoline was pouring out of the the fuel assembly where the hoses connect. Im having a hard time believing that I only have half tank. I had at least 8-10 gallons of fuel before I added 10 more gallons. The pump kicked the handle back so I assumed it was full at that point. Well at least I know what I need to fix. This problem drove me crazy. I thought I had a bad ground. I thought the fuel assembles were bad (which they were, they were due for a change). Thought I had a bad speed sensor and my worst thought was there is a random wire thats broken who knows where in the car. The EKM did not even cross my mind. Most of the modules in my car are replacements. I hope you saw the video I sent you, thats what I meant by saying the gauges jump. I already started looking at picking up a 2nd EKM so far I havent seen anything cheaper than $300... for a used one. Is it possible that something inside can be fixed? Specific to the issue I am having? There have been several reports of EKM failures over the past years but so far I do not know of anyone finding out what is really wrong with it and repairing it. There was one report of a hairline crack or cold solder joint on the PCB which caused diagnostics to fail (no other issues as far as I recall). This was repaired. Normally prevention against cold solder joints is pretty easy by simply reflowing all solder joints. The conformal coating on the EKM PCB makes this nigh impossible, though. For the A1 general module (GM) the most common failure is by far the electrolytic capacitors. It's possible the EKM suffers from a similar fate but I have no further evidence for that. In fact the EKM uses a fairly high quality Nippon Chemi-Con KMF series electrolytic capacitor. It does use 3 tantalum capacitors, though. These components also have a bad reputation but they usually fail in a spectacular way and so far I haven't heard of any such failures (maybe just no one checked as you have to desolder the shielding cans to see the PCB). If you are a bit handy with a soldering iron you may wish to replace these capacitors but there's absolutely no guarantee this will fix anything. If you do, stick to well-known brands for the tantalum capacitors like AVX, Kemet and Vishay. Don't use no-name eBay stuff - it's all crap. Try to apply as little heat as possible while still achieving a good solder joint for the tantalum capacitors - they are very easily damaged by heat. It's probably a good idea to to use the next higher voltage rating for the tantalum capacitors. Both electrolytic and tantalum capacitors have polarity so pay attention to the orientation. The stripe on an electrolytic capacitor indicates the negative lead but on a tantalum it's the positive lead! It's still possible something is wrong with the fuel level sensors but what is displayed on the instrument cluster at least matches what you measure over the sensors. Maybe one of the floats is stuck or the sensor dislodged (I'm not even sure that is possible - I never really looked into the fuel pump assemblies). I did see it but, again, I have no clue what may be causing this. It may be the EKM acting up? I know my GM has been rebuilt as I opened it before and it had newer capacitors in it. Im gonna have to take those assemblies out and check. I mean both of those assemblies are brand spanking new. I forgot to mention but i unplugged the blue connector to the EKM while doing the tests as I couldn't get the brown connector out. I ended up not plugging it back in when doing the tests. I figured that wouldn't effect much. You're theory is probably right as I have no knowledge of the EKM thats in my car (as it was probably untouched). Most of the modules were replaced in that car. The only other information I do have is that my trunk area is taken part, so the CD player isn't connected, and I think i unplugged the AMP. But i dont know if that would make anything else freak out in the car. I think its going to be the EKM like you are saying but before i start buying stuff I want to eliminate as much possibilities as I can. Like the cluster, wire, fuse, relay or some kind of sensor. Sorry, I have no idea. Like I said, I never really looked into the fuel pump assemblies. That's okay. We were measuring just a few specific wires on the brown connector. The other connectors on the EKM do not have any influence on this. I wish I could give you a firm yes or no but the truth is I don't know. It can be extremely difficult to isolate a problem between instrument cluster and EKM. Looking at the various EKM/cluster issues we've had over the years here on the forums I would say that the majority was caused by a faulty instrument cluster (exact cause unknown but problem fixed after replacing the cluster). Still, there were several EKM failures too. Sadly I cannot relate your symptoms to any of the solved cases. If you would have shown me the glitchy gauges without further context I would probably have pointed towards the instrument cluster. But you cannot deny the fact that you do not get a speed signal in the cluster and MID while we confirmed that it does arrive at the EKM. The EKM reads the speed signal and distributes the (processed) signal to other modules like the MID and instrument cluster. The MID works without the instrument cluster installed and vice versa. Thus that rules out that the speed sensor issue is in the instrument cluster. Your car may have multiple issues and the glitchy gauges could be caused by a faulty cluster but there's no hard proof for that. For now logic deduction points at the EKM. Nah, all these systems are pretty much isolated from each other. I definitely agree with that but I'm pretty much out of options. It's not the fuses, not the wiring, not the sensors (well at least not the speed sensor). But maybe we are overlooking something trivial? Do you perhaps know someone else working on a project car not too far away? Do you think you can borrow an EKM / instrument cluster pair? Just for some quick tests so the mileage won't be affected much. It will not tell us where the fault is but it requires no special tools and at least it will rule out external factors and save you quite some money if it turns out to be not the EKM or instrument cluster. Doesn't have to be from an 850i - any E31 will do, young and old (if you go with a different model the indicated speed and rpm may be off but that's not important - you just want to confirm operation of the speedometer and no more glitches). Kamiler, where are you located? I might have a friend who can help me with the actual soldering etc part of the EKM refurb. I can probably do the programming with clear enough instructions. But, I was wondering if I just got a EKM and my cluster and went to BMW and said to make this work. Im curious if they would be able to do it. I do plan on bringing the car to a BMW dealership for a diagnosis once I get everything in working order. To see what else needs to be done. I do plan on doing a cross country road trip in it sometime next year. Backstory: My 850 was rescued from being junked because it had a small fire when it was in the hands of the previous owner before my dad bought it. Fuel line was punctured and fuel caught fire. There was a few things melted here and there nothing too major, wiring was checked and fixed if something was bad. Before you call me "crazy" or "nuts" I know, i would have probably been better off buying a nice condition 850 vs spending my time working on this one (I bought it from my dad), but this car has some sentimental value to me and i pretty much know what Iv done to it, what was changed and what was fixed. Good car to learn on ill tell you that haha. Thats also the reason why the car got all "new" modules. I have found the reason why fuse #1 kept blowing. I noticed that some insulation on the wiring for the aux. water control valve was a little charred and it was flaking. So i looked closer and right where the insulation was beginning (right after the plug) both wire insulation was cracked and the two bare wires were touching. I also noticed that the plug was a little melted. Nothing too bad. Like i said everything on the car works and it runs and drives, minus a few bulbs in a few switches etc and this speedometer dilemma hence why im not parting the car out and I am trying to bring it back to being road worthy. The car really came a long way. So you might want to take advantage of his participation with your issue. cartoonz: I think you overestimate my knowledge. I have a strong suspicion towards the EKM module but it's quite difficult to diagnose problems remotely. Since replacing the EKM can be expensive/difficult it'd be nice to rule out other factors as much as possible. Trying another EKM/cluster pair will not help isolating the problem to either EKM or cluster but if the problem is then gone we'd know for sure the rest of the car is fine (at least with regards to this problem). Will the speedo work with mismatched ekm? I know the odo won't, but the it would seem the needle should move? cartoonz: Unfortunately it will not. All gauges will remain dead. A really annoying decision by BMW as it makes troubleshooting needlessly complex. In regards to all the BMW diagnostic software and cables. Is there links somewhere where I can obtain what I need? 4.) ADS interface (I might have this I just gotta check, might be a ebay one that came with Carsoft a looooooooong time ago.) And I believe that came with a bunch of other cables too. FWIW, My 91 E31 had no Speedo when i received it and a Speedo from a 93 plugged in and has worked since. I do have a euro cluster. But I tried that already got the EEEE on the cluster when i plugged it in. The only thing I can think of is maybe something on the speedometer dial is shot. Not sure if there is anything in the back of it that could have went bad or fried. Everything on the cluster works, except the speedometer. It worked before (long time ago when my dad first got the car running) and so it happened when he let me take out for the first time the speedometer went dead mid-drive and that was about a good solid 15 min of driving in about 80 degree weather before it dropped dead to 0 MPH. In your first post you said that the cluster test worked - so I would have thought that that ruled it out of the equation. Revtor mentioned at the start of the thread that the fuel-level sensors and the speed sensor share the wiring - they do a bit more than that. they share the stable voltage supply from the EKM. Rather than using the 12V supply, both the speed sensor and the fuel-level sensors are supplied with a stable voltage for greater accuracy of the fuel level reading. From your measurements I would suspect that there is a wiring problem between the speed sensor/fuel-level sensors and the EKM - possibly a short to another conductor in the loom - a fault such as this would affect both systems. I should really re-read some of my posts before hitting submit haha. Yea the dial works during the cluster test. Would you be able to guide me a little bit to where to start, or possibly where to start to look in the actual car? I know my entire trunk is taken apart on the inside, I have the rear seats out of the car. Taking out the front seats is a piece of cake at this point. If i remove the seats in the front ill have better access to the wires that run on the sides of the car. Let me know if you would like to see that video. I can provide a Google Drive link. Last edited by Timm; 12-08-2018 at 05:03 PM. Loud nosies from back and speedometer not working!!? ?